Members of the environmental science community from William Paterson University uncovered a mass array of 380 million year old fossils of Nautiloids, cephalopods from the Late Cambrian Era, near campus. They were traced back to an outcrop 127 miles north of Wayne in Clarksville, New York. The find was witnessed by Martin Becker, professor of environmental science, Harry Maisch IV, an adjunct professor of environmental science and WPU seniors Christi Kline and Clint Mautz. The findings were published in Palaeontologia Electronica, the largest electronic paleontology journal in the world. 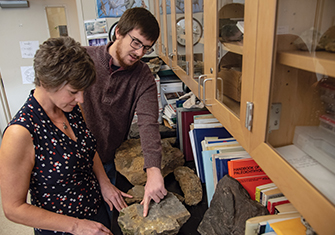 “The exposure of our students and the campus community to these fossils and the geologic history they represent is critical as we address the complex problem of climate change and the role humans play in the process,” Becker said. “These are obvious reminders that the earth is a really old place. It’s very dynamic. Climate change has happened in the past and it’s happening today. So we can look at the past and know, or sort of predict, the future,” said Maisch. A fossil is the remains or impression of a prehistoric organism preserved in petrified form or as a mold or cast in rock. “When you find a fossil like this, right away it’s exciting. You never know what could be in the rock once you split it open. Sometimes you’re lucky and you split the rock open and it has some pretty cool fossil in the middle,” said Maisch. The fossils originated from New York State. They are not local to the area and were brought down to northern New Jersey during the last Ice Age. They were trapped in ice in giant boulders that shifted slowly to the south until they ended up at their final location. The ice melted and the boulder was deposited. The addition of these fossils to the others in the University’s significant collection is regarded as very important to the University’s research in environmental science. “This is a jewel of campus to teach environmental science,” said Becker. The project provides students with a pertinent way to study environmental science.